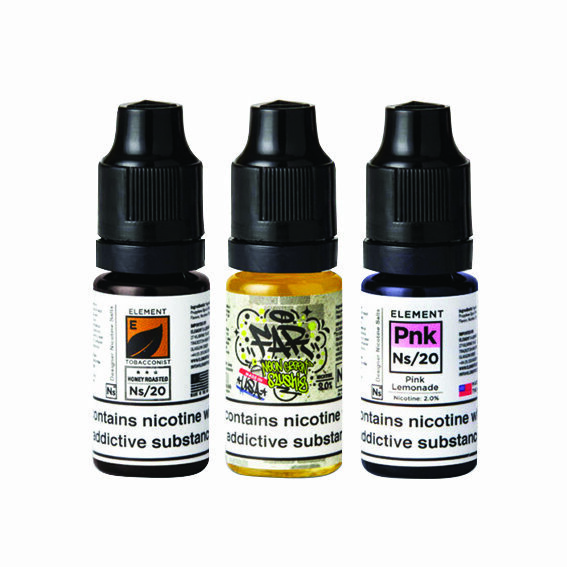 Element NS20 are a collection of salt nicotine e-liquids, featuring classic flavours from popular element ranges including Classic, Tobacconist and FAR. This allows users to consume a higher nicotine concentration without the harsh throat hit. Delivering a higher nicotine concentration gives more of a resemblance to using a traditional cigarette and is designed for those looking to switch from smoking to vaping. 555 Tobacco: a rich and layered robust blend. A dark tobacco flavour makes up the base of this mix. A combination of caramel, vanilla, hazelnuts and walnuts creates a sweet and smooth exhale. Chocolate Tobacco: a blend of sweet and dark notes. The tobacco flavour on inhale has a rich and woody taste, softened on exhale by milk chocolate with sugary undertones and a smooth finish. Honey Roasted Tobacco: a sweet and layered blend. A rich tobacco flavour comes through first with honey notes, complemented by vanilla, caramel and nuts for a smooth, balanced finish. Far Candy Punch: a sugary, candy blend. A juicy mixed fruit flavour hits you from your first vape, with an overall light taste. The rainbow candy on exhale has intensely sweet notes for a real kick. Far Grape Vape: a sharp combination of sweet and sour notes. When vaped there is a dark and rich berry taste combined with a juicy grape flavour. To finish, lighter notes of red grape and a candy exhale are present for a layered vape. Far Neon Green Slush: a citrus blend with a frosty bite. A zesty lime taste hits you from the first vape, for an overall fresh-tasting flavour. The coolness of crushed ice on exhale wraps things up for a balanced, refined vape. Crema: a light and smooth mix with a sweet twist. A layered dairy cream flavour features on inhale and exhale with rich notes. For those of you looking for an all day vape, look no further. Fresh Squeezed: a wave of citrus, fruity flavours from the off. A ripe-tasting orange taste is present throughout, with an added sweetness for a smooth yet balanced vape. Frost: a sharp mentholflavour with a kick. This blend is both sweet and cool with layers of mint and ice combined for an altogether fresh-tasting vape experience. Keylime Cookie: a unique pastry flavour with a sugary cookie mix. A zesty lime transitions into a sweet, buttery biscuit before a citrus kick finishes things off for a balanced yet layered vape. Pink Lemonade: a zesty citrus flavour with a hint of red fruit. This blend is both zingy and sweet; strong lemonade notes with undertones of juicy berries for a layered yet balanced vape. Strawberry Whip: a dessert based blend with a juicy twist and rich undertones. On inhale, a ripe-tasting strawberry flavour hits you before a heavy cream exhale finishes things off. Watermalon Chill: a balanced blend of fresh-tasting fruit with an ice-cool kick. The subtle yet tangy watermelon notes are layered with a crisp mint exhale for a unique, layered vape. Fusions Pink Grapefruit & Blueberry: an intense fruity taste with a bittersweet undertone. The distinct pink grapefruit flavour is blended with the sour yet juicy notes of blueberry for a fresh-tasting, balanced vape.